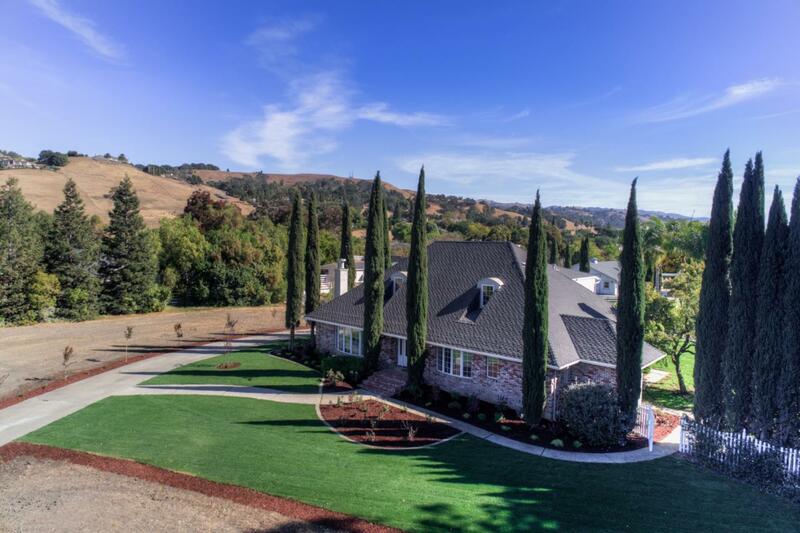 Dreamy Country Estate on one of the best streets in Morgan Hill. Flat 2.35 Acres with horse barn and corrals and an oasis like back yard. Walking distance to 2 wineries, high school and 2miles from downtown MH. Perfect property for horses, vineyards, any type of indoor/outdoor farming or car collector! Main house has 4 car attached garage and the barn areas you can fit 10-15 additional cars. Barn areas are additional 3600 sq ft approx. Completely remodeled with top materials and attention to details. Open and bright floor plan is an entertainers dream. Chefs kitchen with Thermadore appliances, quartz counters and a huge marble island. Hardwood floors throughout, high ceilings, recessed lights, 3 fireplaces, remodeled baths. Master bedroom with adjacent sitting room or office and a sumptuous bathroom with freestanding tub, quartz counters and oversized shower. Large back yard with many sitting areas, large gazebo, outdoor kitchen and sparkling Pebble Tech pool perfect for events.